These Ralph Breaks the Internet Power Pac mini-figures are small and mighty with tons of detail. All your favorite characters from the Ralph Breaks the Internet movie come to you as stylized 2 1/2 to 3-inch tall mini-figures in this Power Pac Multi-Pack. Plus, add these characters to the Pac-Man: Ralph Breaks the Maze App for added play! 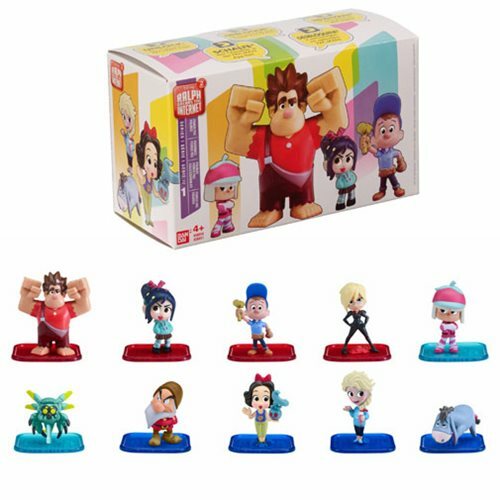 The Ralph Breaks the Internet Power Pac 2-Pack Mini-Figure Wave 1 Case contains 12 individually blind-packaged mini-figure 2-packs and may contain the following characters: Ralph #1 and Eeyore, Vanellope #1 and Taffyta, Snow White and Grumpy, Cy-bug and Elsa, Calhoun and Felix, Ralph#1 and Cy-bug, Snow White and Felix, Elsa and Eeyore, Calhoun and Vanellope, Taffyta and Grumpy, Ralph and Felix, and Snow White and Elsa. Each figure comes a transparent display base.